In this video guitar lesson I’m going to show you the main chord riff to “Wake Me Up When September Ends” from Green Day. The intro, and then the verse chord riff. This song comes from their 2004 album “American Idiot”. Here’s the guitar tablature for the intro and verse riff. See the chords lower on the page for the fingerings. The first 4 chords in the song are fairly easy to play. The notes on the 2nd and 3rd strings stay the same with only the notes on the 4th string changing. You do need to swap the finger you use for the 2nd string note on the 3rd and 4th chords even though it’s the same note. The C and Cm chords are both root on the 5th string barre chords. Then the phrase ends with a open G5 chord. 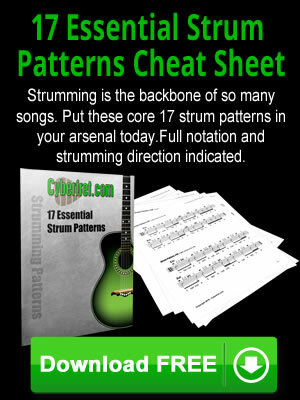 Below you can download a PDF with the tablature and chord charts for this guitar lesson. Here’s a little inspiration for you. It’s a video of Green Day playing “Wake Me Up When September Ends” live.